Rackenford is a tiny village in North Devon, with a population of approximately 400 people, and is surrounded by many farms as agriculture is the main source of employment in the area. 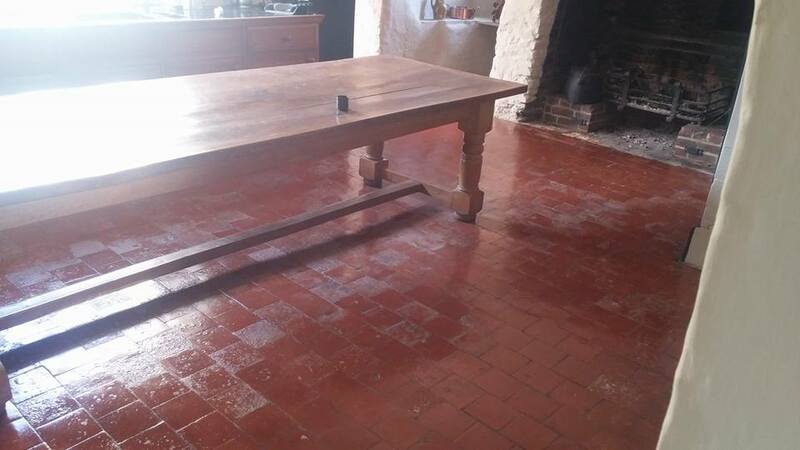 I recently visited one of the farmhouses in the area at the request of the property owner who needed help restoring an area of Victorian quarry tiles which were around one hundred and twenty years old. 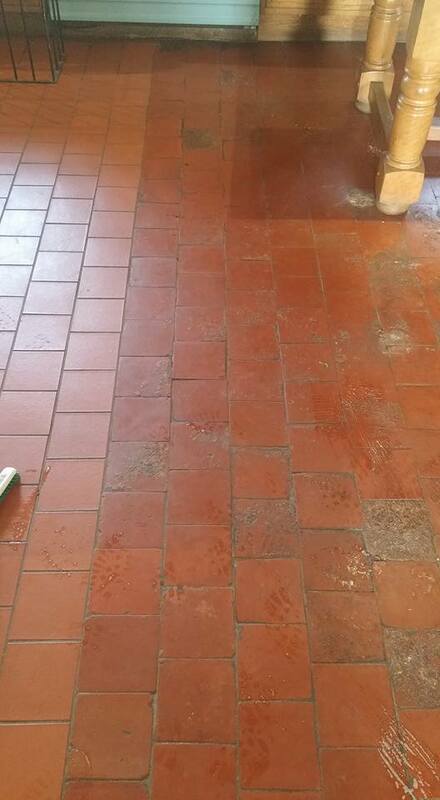 The floor had been extended with a new batch of tiles which ran into a later extension about ten years prior. Both areas were dirty and attracting grime and the older tiles had some heavy damage to some tiles and had lost the colour which was indicative of being covered by carpet for a long period and salts had dried in to the tiles, damaging them and creating an orange peel type of surface. In the past, the floor had been sealed with a topical sealer i.e. one that sits on top of the tile rather than being absorbed into it. In most areas, the sealer had long since worn off but in a few areas that it remained it had been scratched by the chairs near the large inglenook fire at one end of the room. The customer was looking to clean and re-seal the whole floor to try to improve the look of the damaged tiles but also to make the floor easier to keep clean and maintain and were hoping that the divide between old and new tiles was less striking. When it comes to cleaning natural stone tiles, our go-to cleaning product is Tile Doctor Pro Clean. Pro Clean is a multi-purpose, high alkaline cleaner that serves to both strip away any old and ineffectual sealer, and clean heavily soiled stone. The product is suitable for use on all types of natural stone and tiled floors. I mixed a strong dilution of Pro Clean and water before spreading it liberally across the whole floor. I then left it to dwell for roughly 10 minutes before proceeding to agitate it with a scrubbing brush fitted to a heavy rotary machine. This helped to eradicate the soil build-up. Any resulting cleaning slurry was promptly removed using a wet vacuum, before the floor was left to dry completely overnight. Returning to the property the next day, I immediately ran some damp tests to see if there was any excess moisture present on the floor. Knowing that this was an old property, I expected that there would be no damp proof membrane installed and this would increase the chances of damp issues. Thankfully, the floor proved to be completely dry and I was able to seal the floor using eight coats of Tile Doctor Seal and Go. 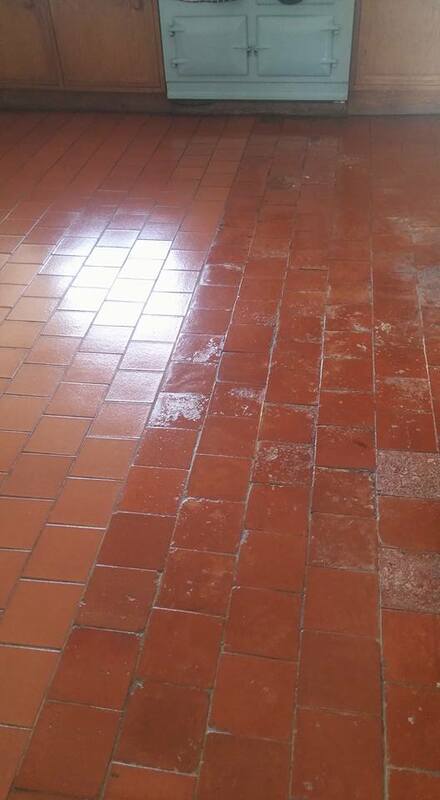 Seal and Go is a water-based acrylic polymer sealer that provides both a stain resistant surface seal and a durable, aesthetically pleasing low-sheen finish that helped to return the natural reddish colours to the Quarry tiles. Although the top layer of the damaged tiles had been lost the colour had returned and were now looking much healthier. With a fresh seal in place, the floor will now be much easier to clean and maintain. The customer was really pleased with the outcome of the restoration, which you can see in the photos below. Another satisfied customer! This entry was posted in Work History and tagged Damaged, Devon, farmhouse, Floor, kitchen, Old, quarry, Rackenford, Rejuvenated, Tiled by AbzDominise. Bookmark the permalink.